Before I review the rather bizarre theories about the end times that are contained in Joel Richardson's and Walid Shoebat's books, I think it would be wise to present some background material about Islam. I realize that many of you are well informed about Islam, but I have found that even those who have studied Islam rarely know anything about Islamic eschatology. As all of you know, the holiest book of Islam is the Qu'ran, which supposedly contains statements of the Islamic god, Allah, which were given to his prophet, Mohammad, by the Angel Gabriel. Mohammad was illiterate, so scribes wrote down what he said over a 23 year period of time, until his death in 632 AD. Much of the content of the Qu'ran was delivered to Mohammad while he was experiencing seizures that even his first wife considered to be demonic in nature. The scribes began compiling the Qu'ran shortly before Mohammad's death. The Qu'ran is about the length of the New Testament. The second most sacred book of Islam is called the Hadith. It is mainly a collection of Mohammad's sayings that were not considered to be revelations directly from Allah. The Hadith also contains stories about things Mohammad did. Strangely, the Qu'ran contains very little prophecy about the end times. It mainly affirms that history will consummate with what's called "the Hour." This is when the resurrection and judgment will take place. So, the Hadith, containing hearsay statements by Mohammed, is the major source of Islamic eschatology. It is extremely difficult to piece together the Islamic concept of the end times. The information is greatly disjointed, being spread throughout the Hadith. Also, unlike Christian prophecy scholars, Islamic students of prophecy have not attempted to systematize their concepts into charts and diagrams which show how all the events are related to each other. The most helpful source I was able to discover was a book by Dr. Samuel Shahid called The Last Trumpet.7 He attempts to show that the major concepts of Islamic eschatology were borrowed from the Hebrew Scriptures, the Christian New Testament, and the concepts of Zoroastrianism. The author is the director of Islamic studies at Southwestern Baptist Theological Seminary in Ft. Worth, Texas. Dr. Shahid proves conclusively that Mohammad secured many of his ideas orally from Christians, Jews, and followers of Zoroastrianism.8 In the process he got many of the stories and principles confused. For example, the Hadith states that the mother of Jesus was Mary, the sister of Moses! Dr. Shahid also points out that the Hadith was compiled at a time when Islamic authorities knew much more about the Bible and Christian traditions and literature. Thus, many Hadith passages were manufactured and embellished and were heavily influenced by Christian sources. Complicating matters is the fact that Hadith passages concerning the end times are highly contradictory, and thus it is difficult to nail down a lot of specifics. Only a general outline of end time events can be compiled. One very interesting aspect of Islamic eschatology is that it presents signs of the times for people to watch for. Like Christianity, Islam teaches that only God knows the exact timing of end time events. But there are signs to watch for that will indicate the season of the end times, and these signs fall into two categories: major and minor. Most of the minor signs have to do with general trends in society. The major signs relate to specific prophesied events that will occur between the time of the appearance of the Antichrist and "the Hour" of resurrection and judgment. The listings of both the minor and major signs vary greatly. An increase in ignorance concerning the fundamentals of the faith. Increasing instability of the faith (Muslims becoming Christians overnight). An increase in false prophets. An increase in apostasy (as evidenced by Muslims following false teachers). An increase in religious pretentiousness (as in the building of luxurious mosques). An increase in alcohol use and illicit sexual relations. An increase in natural calamities. An increase in political corruption. People longing for death (due to the increase in calamities and wickedness). An increase in war and civil wars (even wars among Muslims). A people will emerge who eat with their tongues like cows. Time will contract, with a year being like a month and a month like a week. Wild beasts will speak to men. The Euphrates River will uncover a mountain of gold. The appearance of the Antichrist, called the Dajjal. 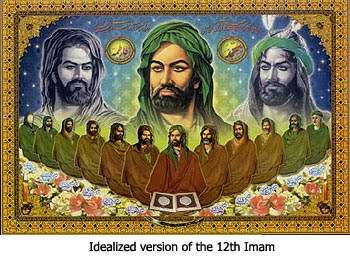 The rising of the Islamic Messiah, called the Mahdi. The Day of Resurrection, called "The Hour." There are many other end time events mentioned in the Hadith, but these are the most important. Let's look for a moment at each of these key events in their chronological order. 1) The Appearance of the Antichrist, called the Dajjal. 2) The rising of the Islamic Messiah, called the Mahdi. 3) The Return of Jesus. 4) The Reign of Jesus. 5) The Day of Resurrection, called "The Hour." 6) The Day of Judgment. In the next installment of this evaluation of the Muslim Antichrist Theory, I'll present Joel Richardson's thesis as explained in his book and make some objections. 6) Wikipedia, "Sahih al-Bukhari," http://en.wikipedia.org/wiki/Sahih_al-Bukhari#Number_of_hadith. 7) Samuel Shahid, The Last Trumpet: A Comparative Study in Christian-Islamic Eschatology, (Longwood, FL: Xulon Press, 2005), 305 pages. 9) Ibid., pages 30-33. See also: G. F. Haddad, "Signs of the Hour," www.livingislam.org/n/signh_e.html. 11) Mission Islam, "Who is the Evil Dajjal ?" www.missionislam.com/nwo/whoisdajjal.htm. See also, Shahid, pages 45-47. 12) Idara Dawat-o-Irshad, USA, Inc., "Identification of the Prophesied Imam Mahdi," www.irshad.org/islam/prophecy/mahdi.htm.. See also Richardson, Antichrist, pages 40-51. 13) Mufti A.H. Elias, "Jesus (Isa) in Islam, and his Second Coming," www.islam.tc/prophecies/jesus.html. See also, Shahid, pages 73-89. 14) Elias, "Jesus in Islam..." See also, Shahid, pages 111-113. 15) Wikipedia, "Islamic Eschatology," http://en.wikipedia.org/wiki/Islamic_eschatology. See also, Shahid, pages 167-191. 16) HilalPlaza, "The Day of Judgment," www.hilalplaza.com/islam/day-of-judgment.html. See also, Shahid, pages 192-210.